Pictured is President & CEO of ITS America, Scott Belcher (on left) and Michael L. Pack (on right), CATT Lab Director at the ribbon cutting of their interactive display in the ITS America offices in Washington, D.C. 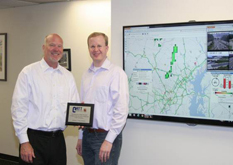 The University of Maryland's Center for Advanced Transportation Technology Laboratory (CATT Lab) is proud to partner with ITS America to make its flagship transportation situational awareness and performance measures visualization system available for viewing and demonstration. The Regional Integrated Transportation Information System (RITIS) is an automated data sharing, dissemination, and archiving system that includes many performance measure, dashboard and visual analytics tools that help transportation agencies to gain situational awareness, measure performance and communicate information between agencies and to the public. RITIS is now showcased on a dedicated monitor in the lobby of the ITS America headquarters in Washington, DC. More on the RITIS platform and other CATT Data Visualization tools can be seen on their website.